Outer Banks recycling, putting it all to good use. Since we started recycling in Nags Head, I have been trying to compost more for my vegetable garden. I see the benefit but don't also have the success I strive for. Do you compost? ever thought about it? I came across this beginners guide and wanted to pass it along. Composting: a word that strikes apathy into the heart of many a suburban gardener. Isn’t it too much work, and can’t I just go to the garden store and pick up a bag of chemical fertilizer? Doesn’t it work just as well as the tree-hugger approach? And come on – what about the smell? Well, no, it’s not as much work as you think. And yes, you can pick up a bag of chemical fertilizer, but it doesn’t do the same things compost does. And just to throw in a dose of good old fashioned guilt, composting is the responsible thing to do, both from a recycling and a wise-land-use standpoint. And guess what? Composting, done right, doesn’t turn your yard into a toxic-smell area. So roll up your sleeves and get ready to rot. Composting is a way of making your own fertilizer and mulch from stuff you were going to throw out anyway. It is a natural process that turns garbage into nutrient-rich soil. Composting happens in nature all the time. It is the process of air and water mixing with dead plant matter to make a hospitable environment for microbes which break it all down. Making your own compost heap or bin helps speed up the natural year-long process to about six weeks. There are a few basics you need to know: a compost bin or heap must be at least three cubic feet in order to work. Anything smaller will not generate the heat needed to break down the organic material. Your compost needs to be turned and mixed at minimum every three days in order to mix the microbes into every part of your heap. And you need to be vigilant – make sure that your heap is not vulnerable to heavy rain. Too much moisture inhibits the decomposition process (and stokes the bad smells), but let your heap get too dry and the microbes will not be able to work their magic. You can buy composting bins at hardware stores, even ones that allow easy turning, or you can build your own. (A bin is not absolutely necessary – you can use haybales or bricks built up in a square to house your heap, or nothing at all.) You will also need a pitch fork, which is the handiest tool to turn, break up and stir your compost. You may need a wood chipper if you want to use branches, twigs and large pieces of waste in your pile. These are the only tools you’ll need to get started. There is a layering method to the madness of composting. All materials you use will need to be chopped or cut up into as small pieces as possible. Spread the chopped materials in layers 3 to 5 inches thick. Start with a layer of brown (dry materials such as straw, wood shavings, chips and sawdust, newsprint, stalks, stems, twigs and the like). Then add a layer of green (wet, nitrogen-rich materials—grass clippings, weeds, prunings and kitchen scraps plant material only; meat and dairy scraps attract unhelpful kinds of wildlife). Atop each brown-green section, add an inch or two of manure or garden soil. This ensures plenty of microbes in the pile. Boost nutrients by adding a shovelful of wood ash, rock phosphate, lime, granite dust, blood meal, bone meal or greensand to each completed section. Moisten each layer of the pile as you go, using a gentle spray. How do you know when your compost is ready for use? It will be dark in color, have a rich, earthy scent to it and the original material will not be distinguishable, having decomposed. 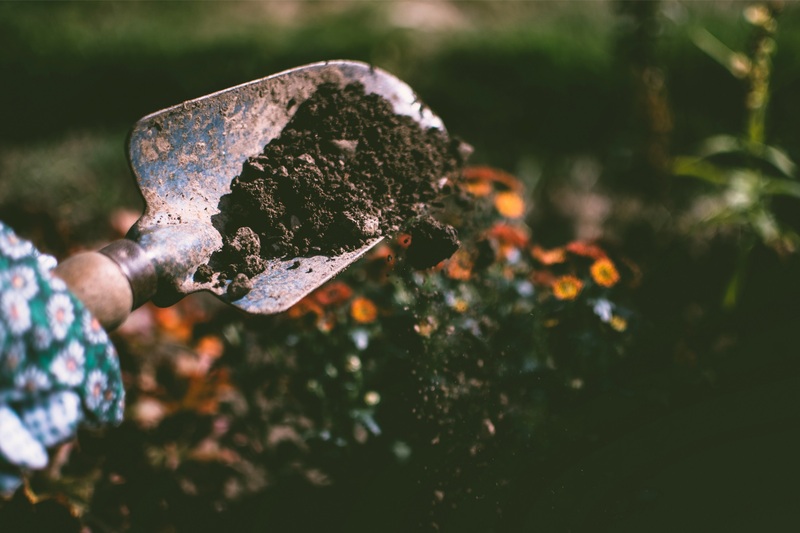 Compost can be used as a top dressing on the soil during the growing season, added in around the bases of plants, where irrigation and soil animals will slowly incorporate it into the soil. On lawns, sprinkle sifted compost as a top dressing in the spring to improve the soil for better grass growth. It is also fine to top-dress houseplants occasionally with small handfuls of finished compost. Compost can also be left on the surface as a mulch around landscape and garden plants. Mulches protect the soil from erosion and promote moisture retention. As they decompose, mulches add nutrients to the soil, and if composed of small-enough particles, worms may slowly eat the mulch and incorporate it into the soil. Compost benefits the soil in ways that synthetic fertilizers cannot. It adds organic matter, which improves the way water interacts with the soil. In sandy soils, compost helps retain water that would otherwise drain down below the reach of plant roots. Compost adds porosity to clay soils, making them drain more efficiently and preventing waterlogging and overdrying. Compost also inoculates the soil with vast numbers of beneficial microbes and the habitat that the microbes need to live. These microbes are able to extract nutrients from the mineral part of the soil and eventually pass the nutrients on to plants.